Human Dermal Lymphatic Microvascular Endothelial (HDLMVEC) are isolated from lymphatic capillaries of normal human dermis. The lymphatic system interacts closely with the blood vascular system in maintaining tissue homeostasis. It plays a vital role in the body by regulating the immune system, transporting interstitial fluid, proteins and fat to the blood circulatory system. Lymphangiogenesis is also implicated in the metastatic process. Although lymphatic microvascular endothelial cells have many properties in common with blood microvascular endothelial cells, they also have unique functions due to their structural features. Lymphatic capillaries have thin and discontinuous base membranes, and lymphatic endothelial cells, unlike their blood vessel counterparts, are not as tightly connected with each other, rendering the capillaries highly permeable. HDLMVEC, together with Human Umbilical Vein Endothelial Cells, both from Cell Applications, Inc., have recently been used in a study demonstrating the key role of Prox1 and FOX C2 proteins in angiogenesis and lymphangiogenesis associated with oral squamous cell carcinoma progression. Characterization: They express VEGFR3, and respond to activation by VEGF-C (see Figure on left). (Cllick to Enlarge) Human Dermal Lymphatic Microvascular Cells (HDLMVEC) in culture (L). 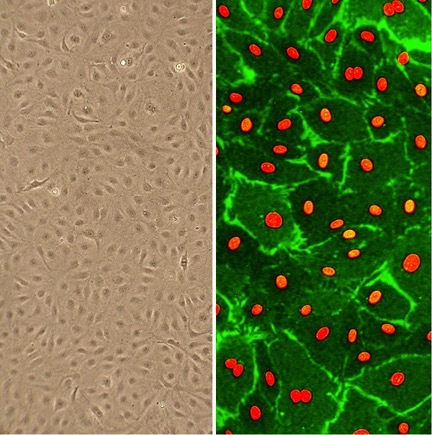 HDLMVEC immunolabeled for CD31/PECAM (green); nuclei are visualized with PI (red) (R). Sasahira, T. N. Ueda, K. Yamamoto, M. Kurihara, S. Matsushima, U. Bhawal, T. Kirita and H. Kuniyasu. 2014. Prox1 and FOXC2 Act as Regulators of Lymphangiogenesis and Angiogenesis in Oral Squamous Cell Carcinoma. PLoS ONE, dx.doi.org/10.1371/journal.pone.0092534. Milner, P., P. Bodin, S. Guiducci, A. Del Rosso, M. Kahaleh, M. Matucci-Cerinic, and G. Burnstock. 2004. Regulation of substance P mRNA expression in human dermal microvascular endothelial cells. Clinical and experimental rheumatology. 22:S24-S27. Suh, W.-H. 2001. Cell-specific targeting polymeric gene delivery carriers. The University of Utah, PhD dissertation.